"I love it!" says super stylist and creative director Ada Kokosar when asked about autumn and the fashion it brings. "I cannot wait to wear layers and create new volumes and proportions. It's my way to play with a look," she says. We were relieved to discover that our holiest of holy fashion icons felt this way. The launch of her latest Midnight 00 collection meant we had a big excuse to tap the New York–based influencer for information at the start of a new season. 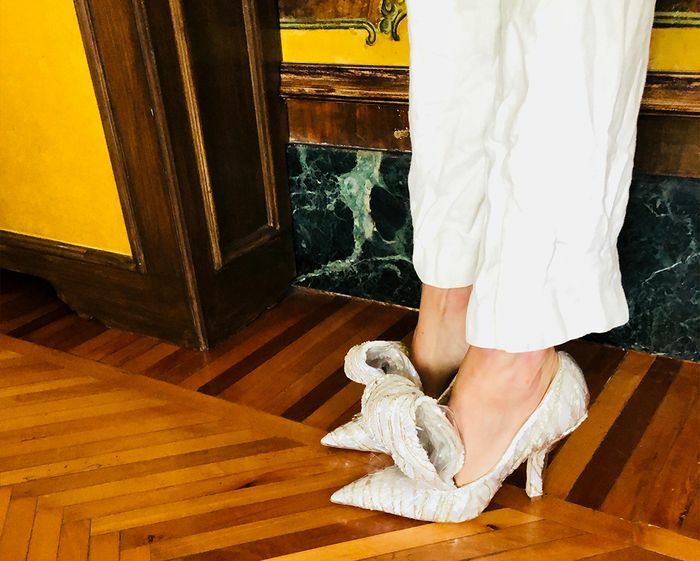 Ada first started her foray into fancy footwear when the Italian brand Cesare Paciotti brought her on board for a collaboration. Her magical vision of Cinderella shoes for the modern, independent woman captured the imaginations of editors and shoppers everywhere. I'm certain you've seen the frilly, frivolous, Insta-friendly shoes on your feed in all their party-ready glory before. The global fashion verdict was a big fat yes to these elaborate pieces and her own line, Midnight 00 by Ada Kokosar. The latest drop has just arrived at MatchesFashion.com and there are monochromatic dots, tulle frills, diamanté studs and more. In fact, her collection empresses most of the trends Kokosar is most bothered about this season. Her overarching A/W 18 hit list includes "velvet, pearl embroidery, white-and-black polka dots and crispy fabrics." Coincidentally, all of those have been ticked off in the outfits she styled up exclusively for Who What Wear UK. Even before the shoe line, we were onto Kokosar's personal style. A while back, she was one of the early & Other Stories collaborators. In fact, I bought multiple pieces from her line and feel disappointed I didn't snap up more. Then there are her street style pictures. Though she doesn't change outfits every two seconds, it's clear that she's a chic, sophisticated woman who knows her own look and isn't afraid to stick to it. 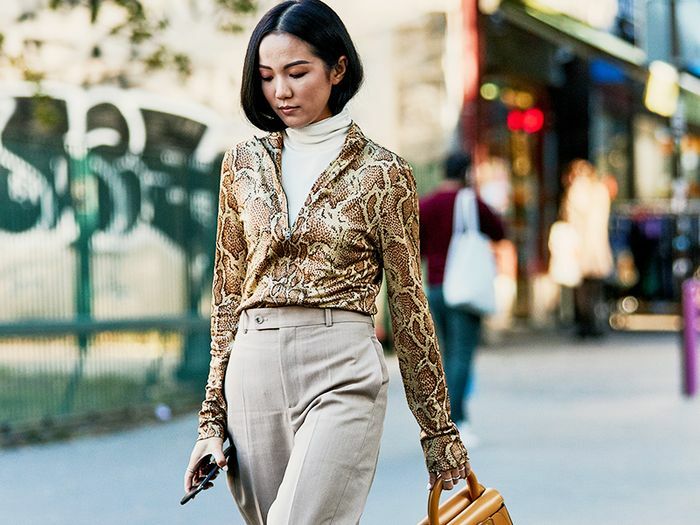 Google her and you'll discover her luxe lineup of simple separates in neutral colours, slouchy suits, cool denim, big coats and—perhaps unsurprisingly—great shoes. It's the kind of aesthetic that just looks rich. Shoes, Kokosar says, are the key to a great outfit. "That's why I have created Midnight 00—a footwear collection that you can wear with a minimal look adding personality, as well as with a more elaborate outfit, to balance your style," she says. With so many luxurious, evening-ready trends on her radar, Kokosar kindly offers up some advice for those who feel a bit daunted by being so dressed up. "For me, it's always about creating a balance between volume/proportions and colour coordination," she says. See the plain cream coat worn with fancy boots? The velvet party dress pushed off a shoulder? That's kind of contrast we're talking about here, echoed in her advice on pairing the right heel height with the appropriate hem lengths. "Kitten heels work best with pants or minis, however, on the contrary, you can also wear it with ankle-length skirts," says Kokosar. "High heels are perfect with long dresses or wide-leg pants." Noted. So when it comes to Kokosar's shopping list for autumn, it seems that her plans revolve around the '80s. There's only one key thing she's gunning for in particular: a sequinned dress from the brand Halpern. As she's also willing to give the decade's puffy shoulders a try, we were interested to know how to make these throwback items look cool again. "I think it's the attitude that makes a look feel current," she tells us. "A combination of confidence, boldness and effortless. With that attitude, you can wear almost everything and always look cool." Next up, the jeans-and-heels outfit ideas we love.